Cascade Medical is committed to providing the highest quality training opportunities for healthcare professionals and our community. Our goal is to enhance knowledge, increase skills, and promote positive patient care outcomes. When appropriate, course certification and contact hour credit will be awarded upon successful completion of the course. Advance registration is required. If you want to register for any educational offerings at Cascade Medical, or if you have any questions, please call EMT Lester Stoltz at 509-548-5815. Class description: The BLS Course trains participants to promptly recognize several life-threatening emergencies, give high-quality chest compressions, deliver appropriate ventilations and provide early use of an AED. This class is intended for healthcare providers, but it is open to anyone from the general public who wants that level of certification. Students participate in simulated clinical scenarios and learning stations. Students work with an AHA BLS Instructor to practice and test BLS skills. Students also complete a written exam. Students will receive a course completion e-card, valid for two years, after completing the course and demonstrating competency in all learning stations, passing the skills test and the written exam. If you are interested in a course, or inviting Cascade Medical to teach a course for your organization, please contact EMT Lester Stoltz at 509-548-5815. Class description: Heartsaver® CPR and AED is a video-based, instructor-led course that teaches adult and child CPR and AED use, infant CPR, and how to relieve choking in adults, children, and infants. This course teaches skills with the AHA’s research-proven practice-while-watching technique, which allows instructors to observe the students, provide feedback, and guide the students’ learning of skills. Students will receive a course completion e-card, valid for two years, after completing the course and demonstrating competency in all learning stations, passing the skills test and the written exam. Cost: $55 for non-Cascade Medical employees, group rates available. Class description: Heartsaver® First Aid, CPR and AED is a video-based, instructor-led course that teaches students critical skills needed to respond to and manage an emergency until emergency medical services arrives. Skills covered in this course include first aid; choking relief in adults, children, and infants; and what to do for sudden cardiac arrest in adults, children, and infants. This course teaches skills with the AHA’s research-proven practice-while-watching technique, which allows instructors to observe the students, provide feedback, and guide the students’ learning of skills. Students will receive a course completion e-card, valid for two years, after completing the course and demonstrating competency in all learning stations, passing the skills test and the written exam. Jan. 26: 10 a.m.-3 p.m. Free Community Class at Icicle River Middle School. Space is limited, advance registration required. Class description: ACLS is an advanced, instructor-led classroom course that highlights the importance of team dynamics and communication, systems of care and immediate post-cardiac arrest care. It also covers airway management and related pharmacology. In this course, skills are taught in large, group sessions and small, group learning and testing stations, where case-based scenarios are presented. Students will receive a course completion e-card, valid for two years, after completing the course and demonstrating competency in all learning stations, passing the skills test and the written exam. Cost: Initial certification $215, renewal course $180 for non-Cascade Medical Center employees. Class description: PALS is an advanced, instructor-led course that uses a series of videos and simulated pediatric emergencies to reinforce the important concepts of a systematic approach to pediatric assessment, basic life support, PALS treatment algorithms, effective resuscitation, and team dynamics. The goal of the PALS course is to improve the quality of care provided to seriously ill or injured children, resulting in improved outcomes. Students will receive a course completion e-card, valid for two years, after completing the course and demonstrating competency in all learning stations, passing the skills test and the written exam. Initial course: If you are interested in a course, or inviting Cascade Medical to teach a course for your organization, please contact EMT Lester Stoltz at 509-548-5815. 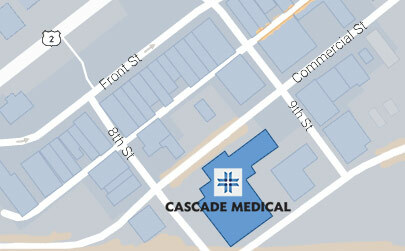 Cost: Initial certification $260, for non-Cascade Medical Center employees. Class description: TNCC is a two-day intensive course with expert instructors. The course includes hands-on training as individuals and in teams, three psychomotor skill stations, five online modules, and evidence-based content developed by pediatric emergency experts. Students will receive a course completion e-card, valid for four years, after completing the course and demonstrating competency in all learning stations, passing the skills test and the written exam. Cost: $305, for non-Cascade Medical Center employees. Provides detailed content on cardiac anatomy and physiology, ECG equipment, lead placement, ECG waveforms and intervals, dysrhythmia analysis and interpretation, and troubleshooting pacemakers. Includes extensive rhythm strip identification practice to build competency. Features real-life case studies to deepen learner understanding and sharpen clinical skills. Breaks down dysrhythmia interpretation by key focus area and concludes with an assessment that demonstrates subject matter proficiency. Cost: Free, class size limited to 15 with preference to Cascade Medical employees. Every winter, our team hosts a continuing education conference for paramedics throughout the Northwest. Check out the presentation slides from our 2018 conference here. Stay tuned for the 2019 dates.